Safety for cyclists across the UK remains a significant issue, with three-fifths of adults aged 18 and over feeling that it is too dangerous to cycle on roads, according to a 2017 report by the Department for Transport. The issue came to national media earlier this year when Graham Simmons, a 28-year-old man from Hampshire, tweeted a video taken on his helmet camera. He hoped to raise awareness of car drivers not paying attention to cyclists and repeatedly nearly causing a collision. He tweeted: ‘I’m going to die on this roundabout and no one seems willing to do anything about it.’ Within a week of posting the video, it had been viewed more than 75,000 times and reported on by many national news sources, including the BBC. With this in mind, Redbrick spoke to students at the University of Birmingham, conducted a survey, spoke to key figures including UoB’s Sustainable Travel Coordinator, Birmingham City Council, and the Commuter Students’ Officer for the Guild of Students. 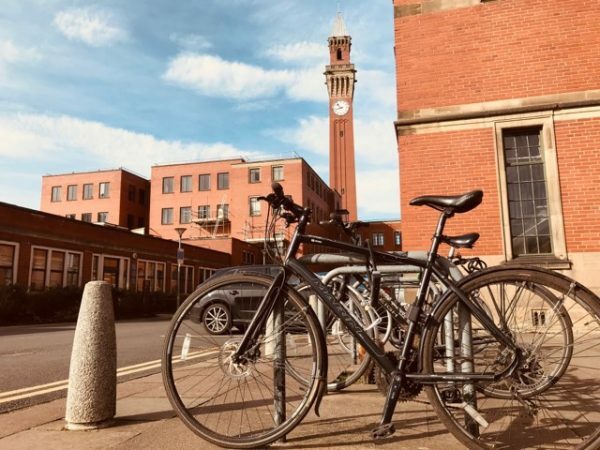 In a Redbrick survey posted to Facebook page popular amongst UoB’s students, ‘Fab ‘N Fresh’, members of the group were asked why they walk to campus instead of cycling. Of the 557 people that responded to the poll, 196 respondents said they simply prefer to walk rather than cycle, with 116 people stating they feel unable to cycle in the first place. 130 do not own a bike, meaning their only option is to walk. However, 54 students in the survey said they are worried about their bike being stolen and 44 simply don’t feel safe cycling on Birmingham roads. Redbrick reached out to UoB students who cycle in Birmingham to ask how safe they feel on the roads. Some students came forward claiming that they have almost been knocked off bikes or been in collisions. The driver then ‘switched off his car and scrambled out and [...] proceeded to shout abuse at me.’ The student noted: ‘None of the other drivers waiting at the lights did anything.’ This student did report the incident to the police. However, their case was dropped after the only witness to come forward wasn’t willing to speak in court. The West Midlands has seen cycle safety measures implemented successfully in the past. In August 2016, West Midlands Police were nationally recognised for their initiative to improve the safety of cyclists on the roads. In addition, ‘Operation Close Pass’ launched in 2017, which is an initiative to keep cyclists safe by ensuring that vehicles leave at least 1.5 metres of space when passing cyclists. Vehicle drivers are pulled over by the police when passing too close to plain-clothed officers on bikes, acting as members of the public. The scheme seeks to avoid the victim-blaming of cyclists, instead placing the responsibility with car drivers. In the same year the initiative was launched, West Midlands Police reported a 20% reduction in cyclists being severely injured or killed on the roads. What’s more, in the 12 months since the scheme was launched 13 motorists were prosecuted on the spot and a further 350 were fined and given licence points after reviewing footage from dashboard and helmet cameras. Birmingham City Council is working to alleviate the dangers of cycling in Birmingham by constructing a cycle path alongside the A38 into the city centre. This is part of the Council’s ‘Birmingham Cycle Revolution’ initiative, which aims to make cycling ‘easier and more accessible’ in the city. The new cycle route is designed to link Selly Oak and the University of Birmingham with the city centre. In total, there will be 4 kilometres of cycleway completely segregated from the traffic flow, providing students with a safe route into town. The project began on the March 5th 2018 and was due to last approximately 50 weeks as part of Birmingham City Council’s plan for safe cycle ways which stretch from the east to the west of the city. By 2033, councillors are hoping 10% of all journeys in Birmingham will be made by bike. In light of the new scheme, the Council said: ‘we want our city to be less congested, greener, safer and healthier.’ In regards to cyclists’ safety in Birmingham, the Council told Redbrick that ‘all road users have equal rights to use the highway safely’ and hope that the new A38 cycleway can help achieve this. In an interview with Redbrick, Peter Edwards, Sustainable Travel Coordinator at the University, sought to advise students on how to make themselves safer on the roads without blaming them for the motorists’ mistakes. Along with the importance of using lights, which are a legal requirement in the UK, he also recommended wearing a helmet and high-visibility clothing. Edwards outlined the importance of cycle training and ability. ‘I see a lot of cyclists cycling right in the gutter which encourages vehicles to overtake you badly.’ He encouraged students to take what is known as the ‘primary position,’ meaning cycling in the centre of the road as a car would at unsafe points such as tight spots between parked cars and at junctions. Bikeability training, which teaches participants how to cycle safely on the roads, is offered at the University, as well as by the Guild during Go Green Week in February. Edwards would like to remind students that local police have said they will accept cyclists on the pavements, if they are being considerate, despite it being illegal. An interviewee agreed with Edwards that it is common to see ‘people pulling out and turning without checking for bikes.’ They noted that being in the centre of the road can help increase your chances of being seen. A final-year student recommended others to install cameras on their bikes, similar to the helmet camera used by Graham Simmons. Edwards confirmed that this evidence can be used when reporting incidents to the police. Further ways of increasing safety, as mentioned by students, include planning routes beforehand to avoid busy roads or busy times. Another example is avoiding the blind spot of large vehicles and not passing along the inside of them. Bike collisions are not the only issue relating to cycling at UoB. Redbrick’s survey found that 10.8% of student respondents choose not to cycle because they fear their bike being stolen. Some students are left frustrated after what Peter Edwards referred to as a ‘spate of bike theft’ on campus. One student told Redbrick that they had their bike stolen from outside the Guild after only leaving it there for 25 minutes. ‘I went to the Guild for help but they seemed to not care,’ they said. The 2018-19 Commuter Students’ Officer, Jules Singh, said he was sorry to hear that this student’s complaint wasn’t taken seriously. He told Redbrick that ‘the Guild will take every opportunity to help avoid theft and maintain safety by providing advice to students where possible.’ He also said that the Guild of Students is doing more to reduce bike theft on campus, including handing out bike locks. Specifically, D locks are the more secure option, according to Edwards. While traditionally cyclists themselves are blamed for a lack of safety, both the University and West Midlands Police argue that car drivers need to protect the most vulnerable of road users. Birmingham roads are dense with traffic and pose a risk to students who cycle. However, the interviewees in this investigation argue that this is a problem that can be overcome with education, carefully chosen routes, and safety equipment. West Midlands Police and the Guild of Students continue to take measures to ensure the safety of students who cycle, ensuring that cycling is an efficient, environmentally friendly, and safe way for students to travel around Birmingham. If students are interested in undertaking a Bikeability course they are offered by the sustainable travel systems office on campus, sustainabletravel@contacts.bham.ac.uk. Alternatively, click here to find a course in the community. West Midlands Police note that you can report a collision by contacting the police via Live Chat on their website between 8 AM and midnight, or call 101 anytime. The University’s Police and Partnerships Hub, located in University Centre, has a regular drop-in service. Times can be viewed online. In an emergency, always dial 999.